What role do glaciers play in terrestrial subarctic hydrology? 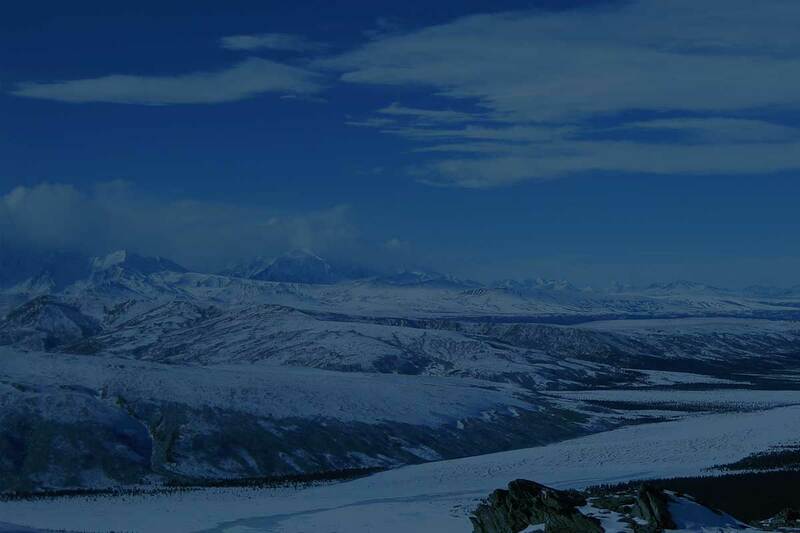 The overall goal is to develop a comprehensive understanding of glacier-permafrost-hydrology relationships in light of the anticipated increases in glacier wastage and permafrost degradation within the discontinuous permafrost region. 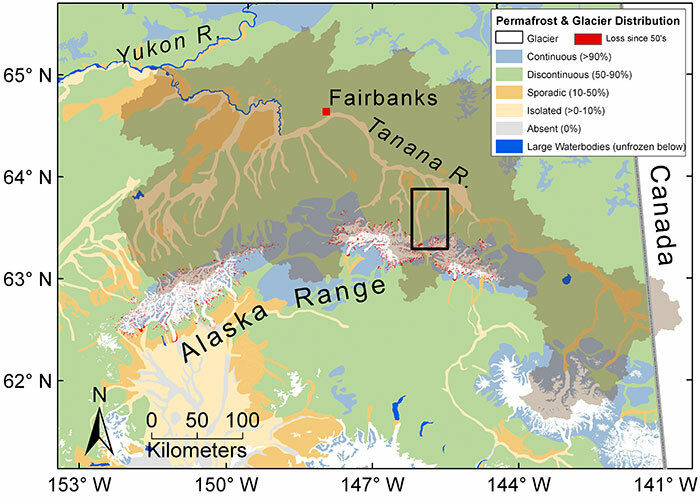 Map 1: Nearly 6% of the Tanana Basin of Interior Alaska is currently glacierized while permafrost is more abundant (Jorgenson et al. 2008). Jarvis Creek (634 km2), a sub-basin of the Tanana and Yukon Rivers, includes many of the typical features of Arctic and subarctic watersheds such as permafrost, tundra and taiga vegetation, glaciers and permanent snow fields. Access and field logistics are relatively simple compared to the typically remote Arctic as a major highway passes through the Jarvis Creek watershed. The community of Delta Junction (~4000 people) and U.S. Army Alaska training lands are both affected by its waters. Therefore, Jarvis Creek serves as the ultimate platform to assess the fundamental science questions related to the integrated glacier-permafrost-hydrology system and its links to the society. By using Jarvis Creek (634 km2) as a proxy watershed, we are developing a comprehensive assessment of the glacier-permafrost-hydrology system in light of anticipated increases in glacier wastage and permafrost degradation with climate warming. Our current limited understanding of the integrated effects of glaciers and permafrost on terrestrial hydrology inhibits our ability to quantify the impact of cryospheric changes on Arctic water resources. Glaciers in permafrost affected landscapes feed and recharge aquifers in otherwise semi-arid lowlands, which despite relatively low precipitation rates, contain extensive wetlands. Both permafrost and glaciers have degraded in the last century. Thus, a growing need exists to explore how the integrated system will respond to a warming climate and especially, what role glaciers and permafrost play in lowland hydrology. In order to answer this question we are synthesizing a physically-based distributed model validated against field measurements including runoff, glacier melt, snow accumulation, groundwater levels, soil temperatures and geochemical signatures. The specific objectives are to: a) Assess the hydrologic pathways of glacier wastage within a watershed underlain by discontinuous permafrost through hydrologic and geochemical field measurements; b) Quantify the effect of glaciers and permafrost on recent historical (1960-present) hydrologic fluxes and storage by combining field measurements with an existing heat- and mass transfer model that couples glacier mass balance to downstream hydrology; and c) Project the future (end-of-21st century) hydrologic regime using custom-derived downscaled climate projections (5 km) for the Tanana River basin, Alaska. The major products will include a quantification of the controls that govern the hydrologic processes in glacier- and permafrost affected watersheds. Our proposed activities aim to advance knowledge across the fields of glaciology, geocryology and hydrology. This NSF funded project is an expansion on pilot studies supported by Cold Regions Research and Engineering Laboratory, Department of Transportation and Public Facilities, Alaska University Transportation Center, Pacific Northwest Transportation Consortium and National Institutes for Water Resources. Photo Above: The Jarvis Creek project is a collaboration between multiple agencies. 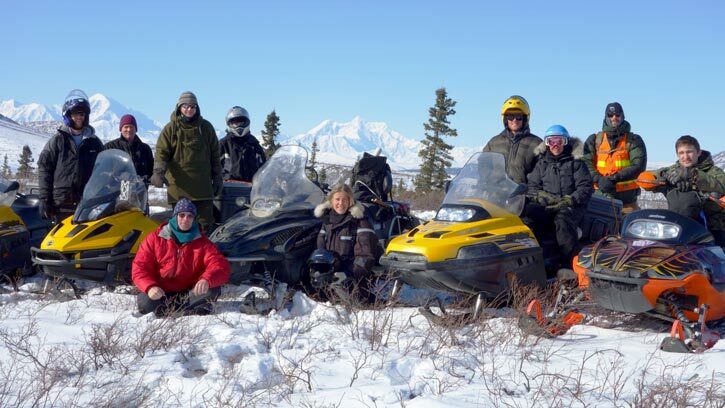 Pictured above is the snow survey crew in April 2013: (back row, left to right) Marc Beede (CRREL), Earl McNabb and Colin Barnard (Salcha-Delta Soil and Water Conservation District, SDSWCD), Joel Bailey (UAF), Will Wright (SDSWCD), Anna Wagner (CRREL), Nathan Stevens (UAF), Ruvim Vorobyov (SDSWCD) and sitting at front, Thomas Douglas (CRREL) and Anna Liljedahl (UAF). Additional collaborators include the U.S. Army Fort Wainwright, U.S. Geological Survey, and the Division of Geology and Geophysical Surveys at the Department of Natural Resources. 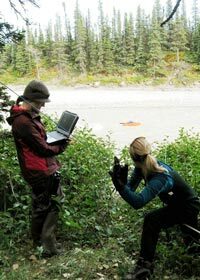 Photo Above: Graduate Student Tiffany Gatesman (hydrograph partitioning and geochemistry), Principal Investigator Anna Liljedahl and Postdoctoral Fellow Anne Gaedeke (hydrological modeling). Brabets T. P. and M. A. Walvoord (2009), Trends in streamflow in the Yukon River Basin from 1944 to 2005 and the influence of the Pacific Decadal Oscillation. Journal of Hydrology, 371(1), 108-119. Jorgenson T. et al. (2009), Permafrost characteristics of Alaska. Ninth International Conference of Permafrost, University of Alaska Fairbanks. Wendler G. and M. Shulski (2009), A century of climate change for Fairbanks, Alaska. Arctic, 295-300. 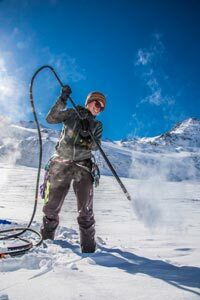 Joanna Young uses the steam drill to install mass balance stakes in the glacier. Jennifer Davis and Anna Liljedahl use a StreamPro ADCP and a tagline to measure the discharge at Jarvis Creek.